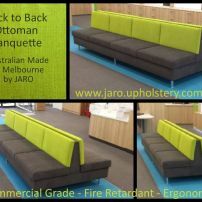 commented on "Banquette Seat - Long Back to Back by JARO, Melbourne"
This long back to back banquette seat is perfect for waiting rooms, restaurants, foyers, hotels and clubs. Extremely sturdy and meets all commercial grade requirements. 100s of colour and texture combinations available.